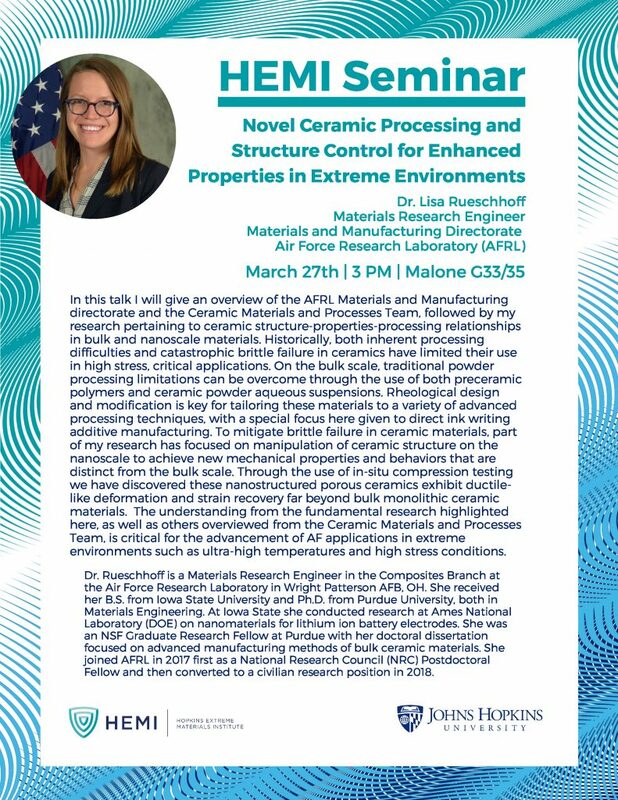 In this talk I will give an overview of the AFRL Materials and Manufacturing directorate and the Ceramic Materials and Processes Team, followed by my research pertaining to ceramic structure-properties-processing relationships in bulk and nanoscale materials. Historically, both inherent processing difficulties and catastrophic brittle failure in ceramics have limited their use in high stress, critical applications. On the bulk scale, traditional powder processing limitations can be overcome through the use of both preceramic polymers and ceramic powder aqueous suspensions. Rheological design and modification is key for tailoring these materials to a variety of advanced processing techniques, with a special focus here given to direct ink writing additive manufacturing. To mitigate brittle failure in ceramic materials, part of my research has focused on manipulation of ceramic structure on the nanoscale to achieve new mechanical properties and behaviors that are distinct from the bulk scale. Through the use of in-situ compression testing we have discovered these nanostructured porous ceramics exhibit ductile-like deformation and strain recovery far beyond bulk monolithic ceramic materials. The understanding from the fundamental research highlighted here, as well as others overviewed from the Ceramic Materials and Processes Team, is critical for the advancement of AF applications in extreme environments such as ultra-high temperatures and high stress conditions. Dr. Rueschhoff is a Materials Research Engineer in the Composites Branch at the Air Force Research Laboratory in Wright Patterson AFB, OH. She received her B.S. from Iowa State University and Ph.D. from Purdue University, both in Materials Engineering. At Iowa State she conducted research at Ames National Laboratory (DOE) on nanomaterials for lithium ion battery electrodes. She was an NSF Graduate Research Fellow at Purdue with her doctoral dissertation focused on advanced manufacturing methods of bulk ceramic materials. She joined AFRL in 2017 first as a National Research Council (NRC) Postdoctoral Fellow and then converted to a civilian research position in 2018.